Yin yang meditation is designed to activate and balance the yin yang energies in your body. There are a few meditation techniques you can use to achieve this ideal state of being. The Golden Wellness Center describes yin yang meditation as uniting yin and yang energies. The website explains that yin yang in the body is found in the upper (yang) and lower (yin) body regions. For example, the yang energy ascends from the person's head, while the yin energy descends to the person's feet. There is a natural separation of these two energies within the human body and a meditation can reunite and restore a healthy balance. For a healthy life, the goal is to reunite the yin and yang energies within your body. When these two opposing energies of yin (female, passive) and yang (male, aggressive) are connected, the mind, body and spirit are able to work together to excel and achieve good health. Golden Wellness Center warns that when yin and yang energies are severed completely, the result is death. This demonstrates the vital importance of reconnecting these two opposite energy fields within your body and maintaining this connection. Yin yang is found in all things, even breathing. The breath is a vital part of all meditations. It's used to relax the body. Three deep breaths are the typical beginning of most meditations. The inhaling of breath is yang. It expands the lungs and oxygenates the body. The exhaling breath is yin energy. It contracts and becomes denser with the release of the breath. This process of inhaling and exhaling is similar to the yin yang symbol of the light tear drop ascending into a bulb then rotating into the expanded dark teardrop that descends. The cycle is neverending. To begin, assume your usual meditation position, either sitting, standing (in the Wuji Stance) or lying down. Take three deep breaths. Breathe in and out through the nose drawing the breath into the lower region of your abdomen to extend the walls of your abdomen and then the upper lungs and out. This wave motion of drawing and releasing your breath relaxes your body. To activate the yin energy, envision the yin as a dark, heavy energy residing in the lower part of your body. With each breath inhaled, you'll send the breath to fill the lower abdominal region and exhale it down your legs and to your feet. You'll continue this rhythm until your body feels weighted down and grounded by the yin energy. When you reach these sensations, you have activated the yin energy in your body. You are now connected to the earth energies. The second part of the meditation focuses on drawing in white light energy through the crown chakra. Some yin yang meditations guide you to do this through the third eye (located in the forehead between your physical eyes). 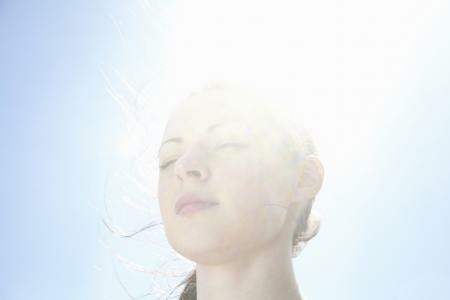 The white light is drawn in with the breath and gradually moved through the upper region of your body to the abdomen. Once you feel the lightness filling your upper body, you'll have activated the yang energy. You are now connected to heaven. The final step is to reunite the two activated energies of earth and heaven. This requires sending the yang energy down your body to blend with the yin energy through inhaling and exhaling. You will send the blended yin yang energy throughout your body. Continue this process until you feel that both energies are equally balanced and are present throughout your body. 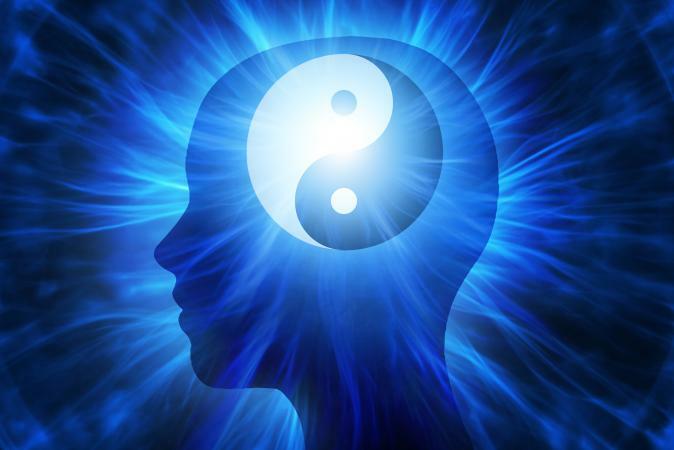 The balancing of yin yang energies through a meditation can have amazing physical, mental and spiritual benefits. According to the Golden Wellness Center, you create a shell that provides protection for your immune system and builds up your resistance to external pathogens through meditation. Your heart chakra is cleansed of negative emotions that can create illnesses and energy blockages. Reduces stress and its impact on your body and health. Eco Institute states the benefits include whole brain thinking and enhanced intuition. The Golden Wellness Center states that the meditation "improves circulation into your peripheral micro-circulatory system of your capillaries, and warms the muscles, nourishing your Luo-Connecting Qi meridians." Luo Connecting Points are the conjunctions where channels branch from the main flow of energy to connect with yin yang paired meridians. Yin and yang meditation is the best way to bestow balance to your body, mind and spirit. There are specific yin meditations and yang meditations that can be practiced. Each has a specific goal that warrants individual meditations. For example, if you wish to attain specific results of the mind then a yang meditation would be appropriate. This could be searching for enlightenment or attempting to open your third eye. A yin meditation would be appropriate when you need to be receptive. You'll want to be careful not to create too much of a separation between yin and yang energies in your body, so also practice yin yang meditation. As with any meditation, each time you practice it, the results are strengthened and you're one step closer to mastering the technique. Use this meditation on a regular basis to promote and maintain a healthy life.